For a pre-Renewal version of this article, click here. The guild system of Ragnarok Online was made to allow the formation of communities with guild members and to form the basis to prepare for the War of Emperium. If you have obtained an Emperium, and have it on the character you want to make the guild on, create a guild by typing /guild "guild name". The character you made the guild on is now the "Guild Master." Once you have made a guild, the name and who leads it cannot be changed (Unless there's something that goes against the TOS, in which case Gravity may either change the name and ask you to come up with a new one, or disband it). Kick all guild members, then type /breakguild "my guild name" as the master of the guild. The guild window is accessed in-game, by pressing alt+G. This window is the interface used to change anything related to the guild, (that can be changed) and to view information such as who is currently online, the amount of people on, and the amount of people the guild can hold vs. the amount of people currently in the guild. General guild information, such as the current number of members, number of online members, leader, and guild level, is displayed here. Alliances are also listed here and the guild leader can remove alliances by right clicking an allied guild name. The tendency feature currently does not work. All guild members are listed here. The leader is always first, with other members being ordered according to their title. Online members will be highlighted here. Members who have been taxed to provide the guild with experience can show the amount contributed as well. For the guild leader, titles of each member can be modified from this tab. Leaving the guild is also available by right clicking a member; guild members and members given the right to do so (via title) can kick anyone, while others can only kick themselves. A total of 20 titles are available and can be set here by the guild leader. The order of titles here will influence the order of members in the Guildsmen tab. The permissions to invite players, kick members, or access guild storage is also given via titles. Available guild skills are displayed here. On obtaining a new guild level, the extra skill point is allocated via this tab. Using active guild skills is also done here. A list of recently kicked members are displayed here. The guild leader may write a two-line guild notice (one short and one long) that will be displayed to each member upon logging in or switching maps. Note that the second line is often overlapped by the chat box scroll bar, so a short and concise notice is preferable. Guild masters can manage members' positions and set experience tax levels through Guild Titles. When being taxed in a guild, only your Base Experience is taxed. Your Job Experience will be unchanged by it. Taxes can only be set up to 50% of your Base Experience. Guild masters can also write messages, which are displayed when members log on/off, Teleport/flywing, or change maps. Note: For people who do not wish to see messages, (such as when teleporting/changing maps often) the /li or /loginout command will disable these messages, as well as "Guildsman _____ has dis/connected" messages. Currently there is no way to change guild leaders on iRO. If the leader of a guild quits playing the game or their account becomes otherwise inaccessible, (such as via being permenantly banned) there is no way to let another guild member take ownership of the guild, and a new guild will have to be created. Guild Titles are set by the Guild Master. They are used to set Guild Tax levels, and special names which can be entered in after a character's name. They also allow the Master to delegate various powers to other members such as inviting new members into the guild, kicking out members, or assigning who may access the guild's storage. Select a design for the Emblem. Emblems must be 24X24 pixels in BMP format using 256 colors, the hot pink color (Red: 255 Green: 0 Blue: 255) will appear transparent ingame. Create a folder named Emblem inside the ragnarok online folder (C:\Program Files\Gravity\RagnarokOnline), copy the emblem file into the Emblem folder. If you do not already have this folder, you will have to make it. The amount of members a guild can hold is 16 (including the Master) by default. This limit can be increased via the Guild Extension skill up to a maximum of 56 members on iRO. Note that there are only 20 Guild Title slots, so grouping members into one or more "default" titles may be necessary with larger guilds. Guilds, like characters, have levels. Guilds gain levels by members who donate their base experience through taxes. 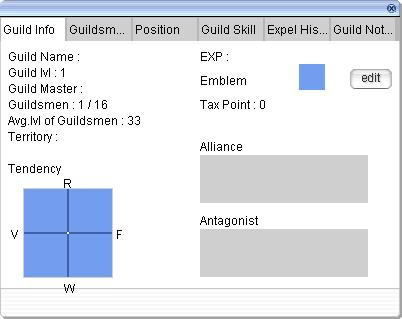 After a guild gains a level, one skill point is obtained, which can then be used on a variety of guild skills. Guilds have certain skills which can be used in or outside of WoE. All "Active" skills can only be used by the Guild Master. This page was last modified on 14 March 2019, at 02:48.